That boy was me, and this was just the first of two things that would happen over the course of the next year, completely changing my whole life. 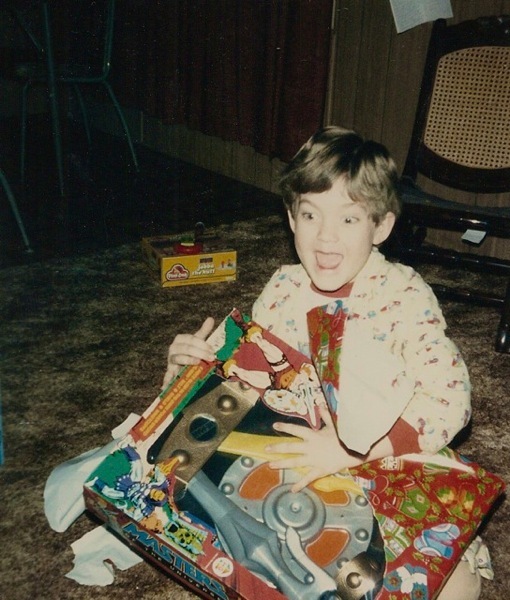 By Christmas of that year, I was utterly obsessed with He-Manâ€™s adventures across Eternia. Nothing on TV compared at all with He-Man and the Masters of the Universe, and my interest in all other cartoons had waned considerably. For Christmas, I really hit the jackpot. Knowing of my love for the FIlmation animated series, my uncle Glen boggled my five-year-old mind with a series of action figures that I had never seen and hat not even suspected existed. 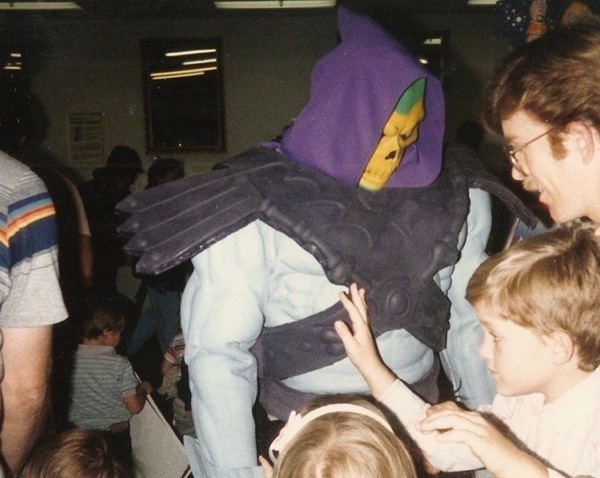 He-Man, Skeletor, Man-At-Arms, Stratos, TrapJaw, and Tri-Klops were all mine that year, and for the grand finale, Castle Grayskull itself. 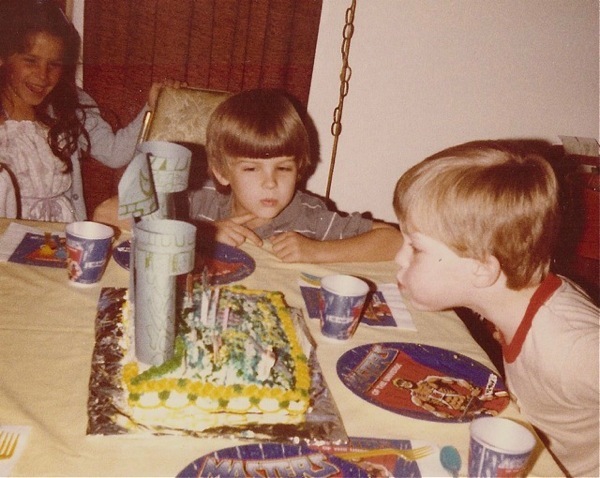 In February, 1984, I turned six-years-old. The party was dominated by all things Masters of the Universe. 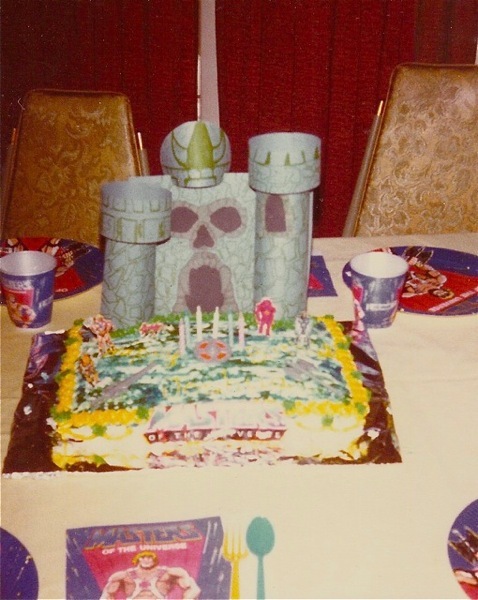 Thinking creatively, my parents made a Castle Grayskull from paper towel roll tubes and construction paper to top the cake. They cut out pictures of the various Eternian vehicles from the back covers of the mini comics which came with the toys, attached them to toothpicks, and parked them outside the castle. In April that year, I became very ill and was hospitalized. I can distinctly remember insisting that the nurse put the TV in my room on the right channel. I couldnâ€™t miss He-Man. While there, I received a Battle Cat and Roton vehicle from my uncles Jay and Glen respectively. These, coupled with my daily dose of Eternian adventures, were the only bright spots in what was an interminable confinement to a hospital bed. At last, I went home. Over the next few months, triggered by an allergic reaction to medication Iâ€™d received while being treated, my vision began to deteriorate. By mid-summer I was suffering monstrous headaches which left me prone for days at a time. My only escape came every weekday afternoon at 4:30. 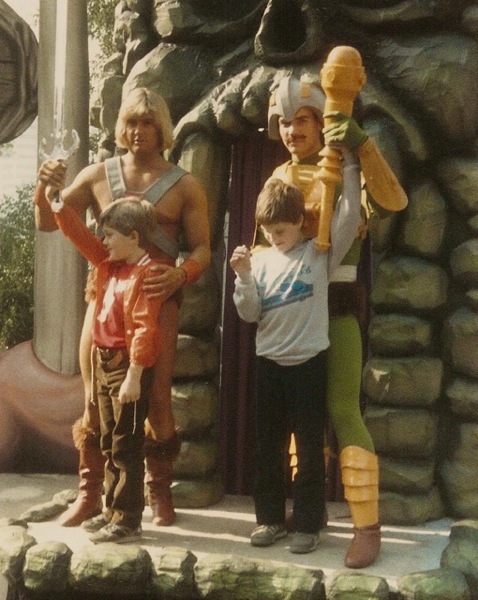 He-Man and the masters of the Universe gave me something each day to look forward to through the haze of pain. My condition worsened as my immune system turned upon itself, my nervous system, and my brain. I was not expected to live long. By the end of the summer of 1984, I was totally blind. I was undergoing all sorts of treatment and testing to try to determine what exactly was happening to me. The doctors couldnâ€™t precisely say. It was around this time that a small package arrived for me in the mail. My parents had contacted Filmation, the animation studio producing He-Man and the Masters of the Universe, and they had decided to send me a cassette tape. I will never forget pressing play on my little cassette recorder and hearing the voice of He-Man, (John Erwin), and Cringer (Alan Oppenheimer), speaking to me directly. They offered me their friendship, their best wishes, and greetings from other residents of the Royal Palace on Eternia. Click here to hear the message. The cassette included the audio to an episode that, at that time, had not yet aired on television, The Cat and the Spider, which remains one of my favorite episodes to this day. The story has a happy ending. I obviously survived the ordeal, though no one was ever able to explain how. 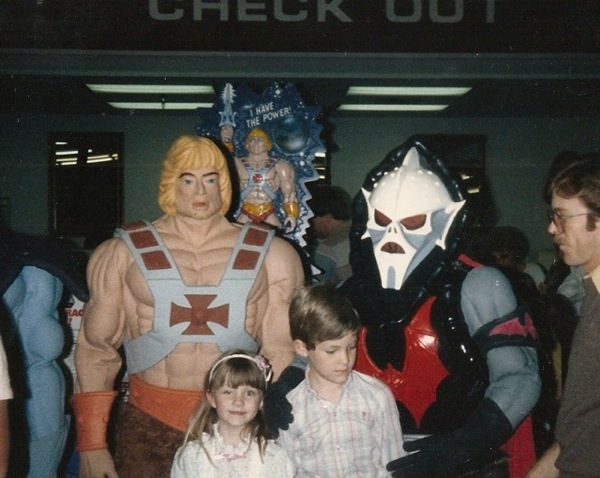 My passion for Masters of the Universe burned ever brighter as the years passed. Some twenty-two years later, I was contacted by BCI-Eclypse. 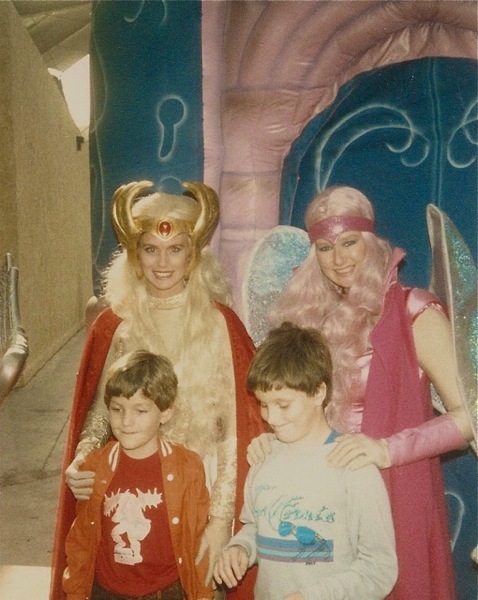 They were preparing releases of the He-Man and the Masters of the Universe and She-Ra: Princess of Power Filmation series on DVD and asked if Iâ€™d like to be interviewed for the set. I agreed. The interview was fun. 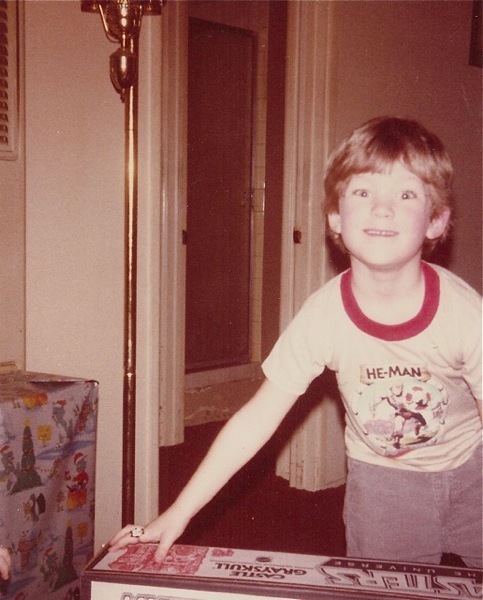 I talked about my lifelong love of the property, how Iâ€™d collected the vintage and 200X action figure lines, and how the Filmation series had had such a tremendous impact on me as a child. I told the story of my illness, and the cassette which had been sent to me by the wonderful folks at Filmation. And then, a surprise was sprung on me. Just as the interview was wrapping up, Lou Scheimer, the producer of the animated series, head and founder of Filmation Studios, and voice actor for Orko, King Randor, and countless other beloved characters, walked up to me on camera. He remembered the story of the little boy who loved his show, and to whom he and his crew had given a boost through his trials. Iâ€™m sometimes asked why Iâ€™m still a Masters of the Universe fan. Is it because of the colorful and imaginative characters? Was it the storytelling talent of the Filmation series? How about the blend of science-fiction and fantasy? The magic? The Adventures? Yes. It was all those things. But, more than those, I think it was the heart that was put into it by all who worked on it over the passed thirty years, from Lou Scheimer to the Four Horsemen, it has been the incredible hearts and souls of those who have put more than just their creative talents into insuring Masters of the Universe has the power.